Wedding singers perform during marriage ceremonies or during receptions, depending on their clients' wishes. 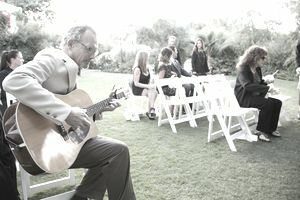 A wedding singer may also act as the master of ceremonies, guiding guests through the wedding festivities. Successful wedding singers can fulfill all the roles their clients' request. You don't need any specific training to be a wedding singer. A lack of vocal training won't necessarily prevent you from working as a wedding singer, but taking voice lessons is a definite plus. Competition for wedding singing gigs is fierce, and unlike an artist recording music in a studio with software to clean up any mistakes, your clients expect you to nail every note, every time. Vocal training teaches you techniques to best harness your talents, which in turn will earn you more business. Finding work as a wedding singer requires a lot of groundwork, but once you establish yourself, your client base will grow by word of mouth. The trick is to always be prepared with music and references to sell yourself to potential clients. With persistence and enough bookings under your belt, you'll find that new clients begin searching for you. The music in which you specialize will vary based on the type of bookings you seek. If you want to sing during wedding ceremonies, learn commonly used religious songs. If you want to sing during receptions, learn popular hits and wedding classic, including top love songs. Ideally, you should familiarize yourself with as much popular music as possible and be ready to perform a variety of songs from different genres. Keep in mind that you are likely to get requests, so you want to be as prepared as possible to limit the number of times you have to say, "Sorry, I don't know that one." To sell yourself as a wedding singer, you need audio or video demos to share with potential clients. Your demo should include songs that show your range. Love songs, hymns, and popular dance songs make good choices to include in demos. Prepare your demo in a variety of formats: downloadable file, CD, and online streaming. You should also set up a basic website that includes streaming audio or video demos, as well as your photo and contact information. After performing your first gigs, you may wish to place ads in the wedding section of your local newspaper or local bridal magazines. Even if you don't yet have the money to place such ads, browse local wedding publications to learn about your competition. Make a note of the way established wedding singers market themselves and incorporate the things that seem to be working into your website and social media profiles. Wedding planners always refer wedding singers to their clients. Sometimes they collaborate exclusively with a few select singers and other times they keep a list of singer contacts on hand. To work continuously, you want as many wedding planner allies as you can get. Contact local wedding planners, ask for an appointment, deliver your demo and be prepared to audition, if necessary. Be ready for when you see a bulletin board or other posting area in your community. Being a wedding singer is a local beast, so always be ready to take every opportunity to get your name out in your area. Coffee shops, cafes, churches, bridal boutiques, tuxedo rental businesses, limo rental companies, halls—all of these places are great locations to post your business information. Make it easy by providing a short comment card or form they can fill out, and get their permission to use their names. Continually update your website with this information as you perform more and more weddings so new clients always have an up to date resume to view. Also be prepared to present these references directly to new clients.